Two weeks ago I was lucky enough to find myself in San Francisco. I was there when Victorian Premier Daniel Andrews gave his historic apology to those who suffered under Victoria’s gay conviction laws. While I was disappointed to miss out on such an historic occasion, I was pleased to be in another place of great significance to the LGBTI community – the Castro. During World War II, San Francisco was a major port of embarkation and housed a naval training facility. A melting pot for people from all across the country, San Francisco became a place known for its relative openness and tolerance. During the war, the US military began discharging men for homosexual behaviour. As well as putting an end to a soldier's military career, this 'blue discharge' - as it was known - often had negative effects on their civilian life, putting pressure on men to find employment and housing for their families. You can read more about this here. San Francisco appeared to be one area where men and women could find people who were tolerant. The Castro district, named after military leader José Castro, became a popular gay neighbourhood as more and more gay men moved into the area in the 1950s, 60s and 70s. Harvey Milk, possibly the area’s most famous gay resident, moved there in 1973. Just as Harvey Milk was leading the way in political advocacy for the LGBTI community in San Francisco, gay activism in Australia was making headway with the formation of groups such as the Melbourne Gay Teachers Group and CAMP (Campaign Against Moral Persecution) in Sydney. Yet homosexuality was not decriminalised in Victoria until 1980. It took even longer in New South Wales, where the law was changed in 1984. We’re forced to deal with this unbelievable circumstance of a community that in addition to being hated and under attack is now forced alone to try to figure how to deal with this extraordinary medical disaster. Just like the gay community in Victoria, the community in San Francisco was quick to act in defence of this still unknown illness. In Victoria, the approaches of the Victorian AIDS Council and Gay Men’s Health Centre became part of what was known as a uniquely ‘Australian model’ for dealing with the AIDS crisis. The approach adopted by the Australian government, spearheaded by Federal Health Minister Neal Blewett, involved working closely with existing community-run HIV/AIDS organisations that were running education and support programs, while at the same time funding medical research and development and maintaining bipartisan political support. You can read all about the incredible history of the Victorian AIDS Council in a history we produced in 2013, Under the Red Ribbon. In San Francisco, and indeed across the US, the conservative Reagan administration was slow to react to the rapidly developing epidemic. Due to the government's fear of losing support from more conservative and religious sectors of the community, funding was limited and hard to secure for organisations run by the gay community. Photographer Thomas Alleman captured much of what life was like in San Francisco from 1985 to 1988. His series of photographs 'Dancing in the Dragon's Jaws' was displayed at the San Francisco Public Library for World AIDS Day 2012 and can be seen here. One positive legacy of the epidemic was the creation of the GLBT Historical Society. Originally founded as the San Francisco Bay Area Gay and Lesbian Historical Society in 1985, the society was created to capture and preserve the records of the gay and lesbian community in the Bay Area and to make this history available to the community. With the AIDS crisis ostracising many from their families, friends wanted a way to remember those who died and somewhere to preserve their possessions. A small group of people actively set out to save the belongings of gay men that were being thrown away, sometimes diving into dumpsters to retrieve them! Feeling like a community abandoned, the formation of the historical society was an important way for the gay community to record its history now and for the future. Today, the GLBT Historical Society has a museum in the Castro that displays exhibitions on a range of topics, including the AIDS crisis, Harvey Milk, the fight for equality, women’s history, queer immigration stories, marriage equality and many, many more. The Castro today is a major tourist hot spot and remains the destination of choice for those seeking the freedom and acceptance that is still sadly not always found everywhere else. But amidst the outrageously gay businesses, nightclubs and numerous pet accessory stores, the neighbourhood does not forget the battles its community has fought and the hardship it has witnessed. In February this year, Australian artist Deb created a beautiful mural celebrating marriage equality. The Rainbow Honor Walk down Castro Street is a volunteer-run project that pays tribute to LGBTI individuals and their significant contributions to the community. Harvey Milk’s camera shop is now the Human Rights Campaign Centre, and continues to perpetuate not only his memory, but also his mission for a better tomorrow, for equality and for a world without hate. The centenary of World War I has prompted many Australians to delve into their own family history and discover the wartime experiences of their ancestors. Us historians at Way Back When have worked on a number of war-related history projects in the last few years and become pretty adept at uncovering these forgotten Anzacs and interpreting the sometimes complicated and often hidden military archives. So we thought, why not share the tips and tricks we've developed over time with those people wanting to know more? We recently gave a presentation for the City of Boroondara at Hawthorn Library on researching military ancestors and it was met with great enthusiasm from attendees. So we've decided to take this show on the road. If you are interested in having us speak to your group or organisation, please contact us. Throughout 2015 we have been working with Whitehorse City Council to produce an exhibition commemorating the centenary of World War I and examining the impact of the war on the local community. 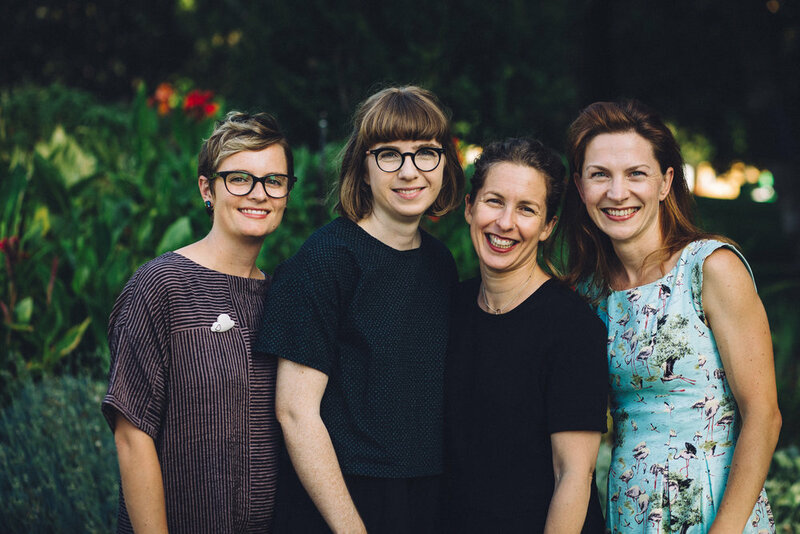 Australia Calls was launched in the Whitehorse Artspace at Box Hill Town Hall on Friday 11 September by Whitehorse City Councillor Helen Harris, Federal Member for Chisholm Anna Burke and Federal Member for Deakin Michael Sukkar. The exhibition examines the impact of the war on Whitehorse by exploring the stories of local families and individuals – from those who enlisted and experienced the war first hand, to residents who contributed to the war effort from Australian shores. We had the rich resources and archival collections of local historical societies to draw on, as we researched the stories of five local servicemen and examined themes including local recruitment efforts and fundraising activities, the conscription debate, and efforts to support returned serviceman following the war and to commemorate their experiences. Way Back When historian Nicole Curby with panels telling the stories of local servicemen. The exhibition also features abridged articles printed in local newspapers during the war, and stories contributed by the family members of local residents who lived through the war years. There are items from local heritage collections and private family collections on display. We also conducted an oral history project with descendants of local servicemen, and the exhibition features four audio documentaries created from these interviews. The documentaries include stories from the battlefront and examine what life was like for returned servicemen after the war. Click below to listen to this short audio documentary on remembering World War I. Way Back When historians Sarah Rood, Fiona Poulton and Katherine Sheedy (far right) with local council and historical society members. It was a privilege for us to work with Whitehorse City Council, local historical societies and community members to produce this moving, informative and stunningly presented exhibition. We would like to thank the historical societies and community members for generously sharing their collections and stories with us. Australia Calls will be open until 14 October 2015. We urge you to visit and explore the impact of the war on the Whitehorse community. Way Back When was engaged by the National Trust of Victoria to facilitate the History in Place project at four National Trust sites. The History in Place project is the result of a partnership between the Heritage Council of Victoria, the History Teachers’ Association of Victoria and Culture Victoria. The project was designed to establish a framework for students to engage with their local history and heritage. Over the course of several months, Way Back When coordinated the History in Place project at the Portable Iron Houses in South Melbourne, Mulberry Hill in Langwarrin, Endeavour Fern Gully in Red Hill and Gulf Station in Yarra Glen with groups of local primary school students. Each school was taken on a tour of the site and encouraged to take photographs, film and notes about the site and themes that interested them to later turn into a film using an iPad and iMovie. The hands-on nature of the day appealed to students and they loved using the iPads to film, photograph and curate their films. The films the students produced showed us what appealed to them at each site. The slaughter house was a particular favourite at Gulf Station, while Daryl Lindsay's paintings were a highlight at Mulberry Hill. It was a great learning experience for us as historians. Working with kids between 10 and 12 years of age certainly presented some challenges! But it was so rewarding to be a part of students experiencing history in a tangible way, sometimes for the first time. The students' positive reactions to the sites, the concepts and the overall project were so encouraging and reaffirmed to us our belief that history is inherently interesting and fun - when presented properly. A bonus for us in this project was getting to work with so many passionate and interesting volunteers at each of the National Trust sites. Without the dedication of these people, these important historical links to our shared past would not be accessible. So we'd like to say a very big thank you to everyone who helped us with this project. If you'd like to see what these students came up with, the finished films will soon be available on the National Trust website, so stay tuned! On Saturday 11 April our latest history Boroondara Remembers: Stories of World War I was launched along with the City of Boroondara’s ‘Gallipoli and Beyond’ events program. Way Back When was thrilled to attend this auspicious occasion as part of commemorations of the centenary of World War I. The Hawthorn Arts Centre was packed with local residents, historians, community members, politicians, families and friends, all keen to participate and strengthen their connection to our shared past. Thankfully, Edward survived the war and returned home to his family three years later. We had the privilege of meeting Edward’s grandchildren and capturing Edward’s story in this history. His is just one of many stories of the ordinary men, women and children who lived in the city of Boroondara during World War I and experienced the hardships and community spirit of the time. Authors Fiona Poulton (L) and Lucy Bracey (R) with local resident Isabel Harkensee (centre) who was one of many Boroondara residents who shared their WWI stories with Way Back When for this project. There will be many histories written for the centenary of Gallipoli. But I would encourage you to read this one – it is a deeply personal local history and we are all the richer for knowing about the lives of these Boroondara ANZACS. The Federal Member for Kooyong, the Hon Josh Frydenberg MP, was also in attendance and spoke passionately about the centenary of WWI and the City of Boroondara's work to commemorate it. Authors Alicia Cerreto, Fiona Poulton, Katherine Sheedy and Lucy Bracey with Hon Josh Frydenberg MP. 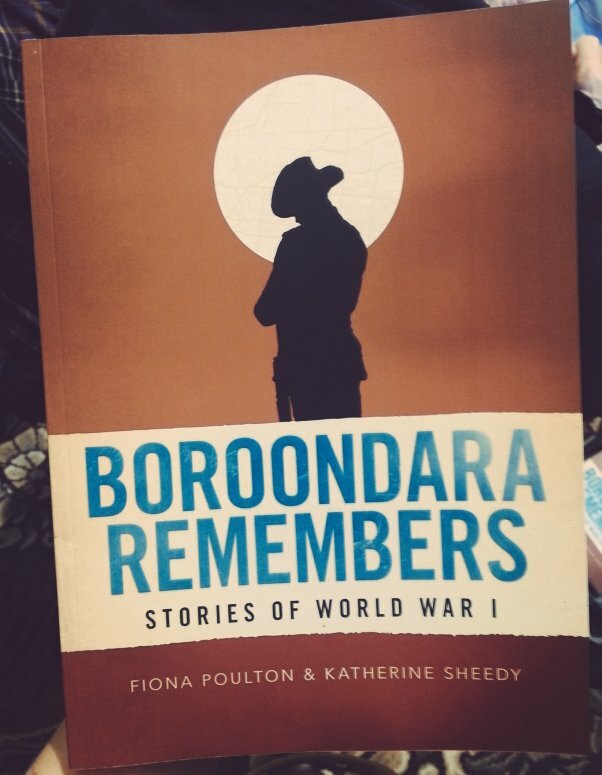 The launch of this publication marked the beginning of a series of events the City of Boroondara is hosting to commemorate the Anzac Centenary. The full list of activities can be found on their website. 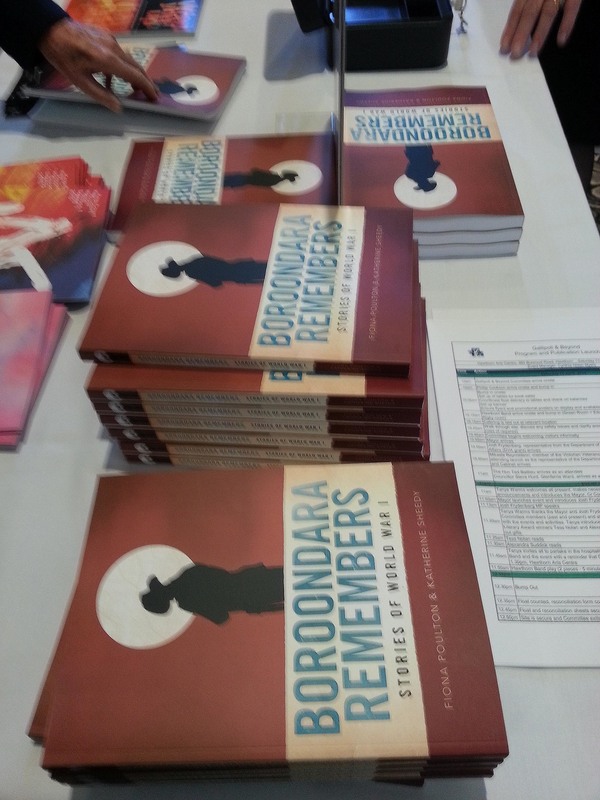 Copies of Boroondara Remembers: Stories from World War I are available for purchase from the website above through the City of Boroondara. This is just the beginning of Way Back When's involvement with projects commemorating the centenary of WWI, so stay tuned for more stories of Victorians at war.